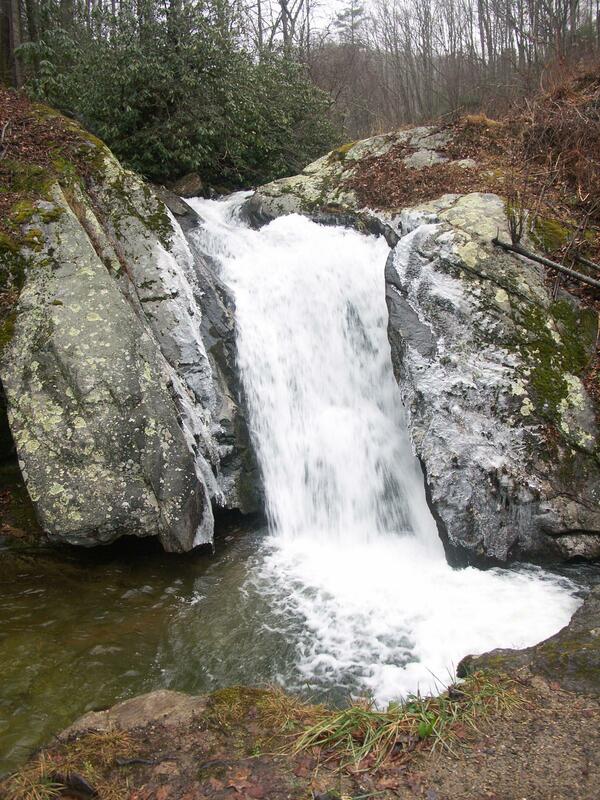 Water is squeezed around a cleft in some big, lichen-covered rock outcrops, then tumbles down a narrow cascade into a round pool where the creek makes a 90-degree turn. The water is clear, and in high water the falls feels pretty powerful despite the creek's relatively small size. The rocks are very interesting, and colorful ones lie under the pool. From the US 19E/19W split about 4 miles west of Burnsville, NC, take US 19W West for 17.8 miles to the parking pull-off on the left side of the road, in a right-hand curve. The pull-off is 4.2 miles East of the Tennessee state line if you're coming from that direction, on the right just past a National Forest road. You can't see the falls well from the road, but a steep, rough scramble path leads down the slope to a boulder overlooking them. With a good bit more effort and caution, you can get down to the base of the boulder and the plunge pool.